Maximum Wire Diameter: 3/16", Pin Size: 3/8"
Model Number: 84-88 Schaefer chainplates are made from high quality stainless steel, tumbled and polished to a high luster finish. 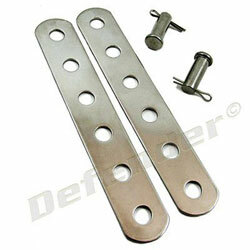 Chainplates are rated to work with the corresponding pin/wire size. 600650 Schaefer Flat Chainplate Schaefer 84-88 Schaefer chainplates are made from high quality stainless steel, tumbled and polished to a high luster finish. 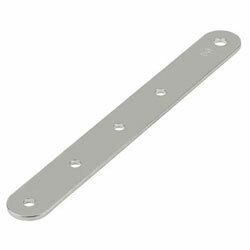 Chainplates are rated to work with the corresponding pin/wire size. Model Number: 85-22 Schaefer Strap Tangs are made from high quality stainless steel, radius chopped, hole punched, tumbled and polished to a high luster finish. 603394 Schaefer Strap Tang Schaefer 85-22 Schaefer Strap Tangs are made from high quality stainless steel, radius chopped, hole punched, tumbled and polished to a high luster finish. Model Number: 85-03 Schaefer Strap Tangs are made from high quality stainless steel, radius chopped, hole punched, tumbled and polished to a high luster finish. 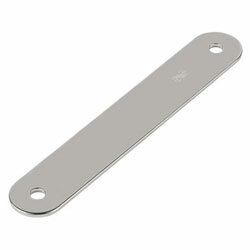 603387 Schaefer Strap Tang Schaefer 85-03 Schaefer Strap Tangs are made from high quality stainless steel, radius chopped, hole punched, tumbled and polished to a high luster finish. Model Number: 85-32 Schaefer Strap Tangs are made from high quality stainless steel, radius chopped, hole punched, tumbled and polished to a high luster finish. 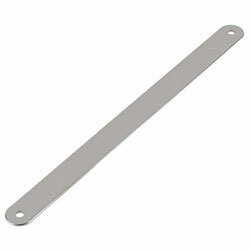 603403 Schaefer Strap Tang Schaefer 85-32 Schaefer Strap Tangs are made from high quality stainless steel, radius chopped, hole punched, tumbled and polished to a high luster finish.